Best WiFi Names 2017: In the current generation, WiFi is inevitable as it becomes part of every individual life. WiFi is the best way to connect to the internet. If you have a near wifi and know the password, then you’ll have the whole world at your fingertips. Creative people always try to make their WiFi network names witty and much funny. Having funny WiFi names is the best way surprise neighbors, who look for free internet. and it can tickle your friends as well. Some intellectuals have come up with some of the clever wifi names you will ever see. 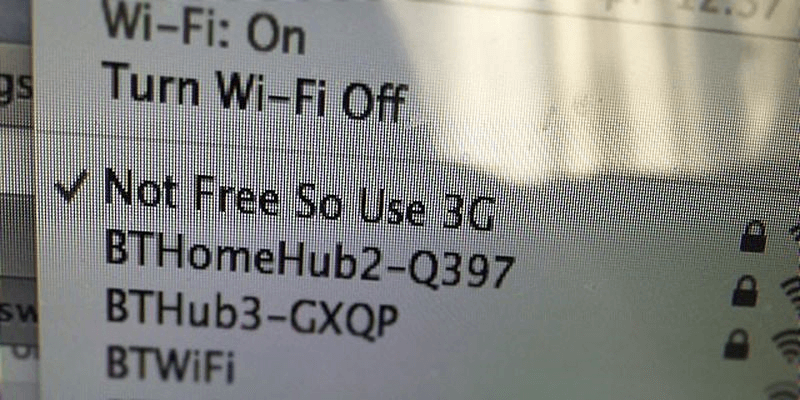 in this article, I have collected some of the best wifi names for you. No Free WiFi for you. Krish! Stop using our Internet! I Love it When IP. No Free wi-fi for you. Having clever and funny wifi names is a great way to tease your annoying neighbors. These are some best wifi names if you want to freak out with people nearby accessing your network. Drop it like its hotspot. Get Your Own Net Bro. Dare Enough to Connect now! 99 Problems, but WiFi ain’t one. Your Wireless router comes with a default name and password. But you can change the name and password to anything you want in a few clicks. changing the default name gives you a chance to use something different than “DLINK-420” or “LINKSYS”. You should also use a password that is easy to remember. for more detailed information on how to change Wi-Fi name check this article. These are some of the best wifi network names. If you want to surprise your neighbor, use one of these as your wifi name. Let me know if you have any crazy ideas for WiFi names below in the comment section.